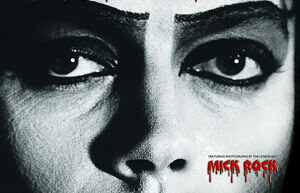 From Slow Dazzle Worldwide, here in the UK comes news of the Rocky Horror Official Calendar Two Thousand & Seven once more "Featuring the legendary photographs of Mick Rock". Now available to buy the cover image this year is a nice close up of Mr Curry himself. This years Calendar is once more presented in the same fashion as previous years. It is a 30cm x 30cm (12" x 12") page folding out to show the main image as the top half of a double page (60cm x 30cm), with the calendar section below. The calendar is also punched with a small hole to hang it on a nail. You could have also won a copy of the Calendar in our September Competition here on the site. As well as the main image there is the cover image repeated on each dates page as a background image. The center spread this year features a nice full length image of Janet from the floorshow scenes as well as some repeat images of four of the months. Dave's Fave this time has to be the center spread of Janet. Selling Price around £9.99, although you may find it a little cheaper. This item will be added to the Members merchandise for fan club members as well. Once more Slow Dazzle will be donating a portion of the proceeds of each sale to Manchester Children's Hospital on behalf of Richard O'Brien. All images copyright Mick Rock/Slowdazzle 2006.